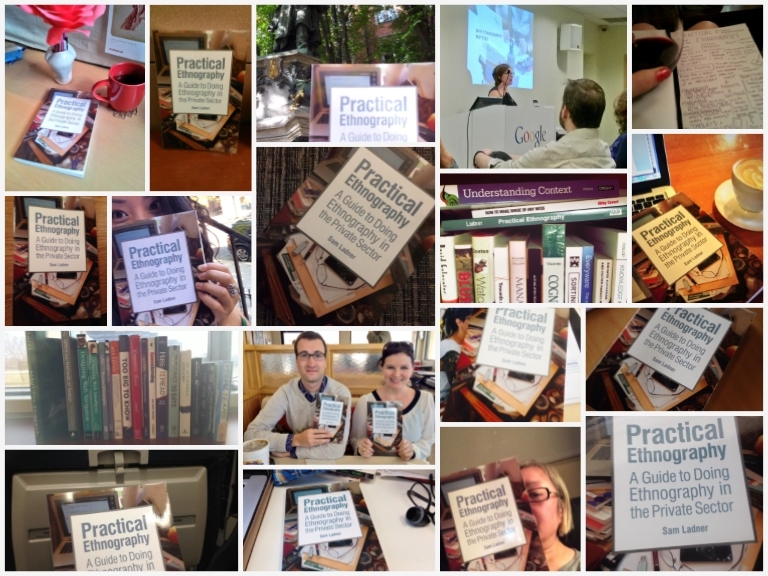 I’m best known for my book Practical Ethnography: A Guide to Doing Ethnography in the Private Sector. This book has become a staple for design research and innovation courses, as well as a go-to handbook for applied ethnographers. I am delighted to share some of the fantastic photos readers have shared with me, from around the world. You can also visit my profile on Mendeley.com which has links to my publications and those in my Mendeley library. This site also includes many blog posts on productivity, mobile technology, and the design implications of today’s workplace. Ladner, S. (2015). “Managing The Private Sector Research Project.” in Dingwall, R. (ed.). Sage Handbook of Research Management. Sage: London. Ladner, S. (2014). Practical Ethnography: A Guide to Doing Ethnography in The Private Sector. Leftcoast Press: Thousand Oaks, California. Ladner, S. (2014). “Bodywork And Its Role in Productivity.” Paper presented at Ethnographic in Praxis Industry Conference. Fordham University: September 1-2. Ladner, S. (2012).“Ethnographic Temporality: Using Time-based Data in Product Renewal”. Paper presented at the Ethnographic Praxis in Industry Conference. Savannah: Oct. 12-13. Ladner, S., Rogers, S., and Middleton, C. (2012). “Why are you always on your phone?” The use of smartphones to manage work and domestic responsibilities.” Paper presented at the Women and Families Researchers’ Network Conference. New York City: June 12-14. Ladner, S. (2012). “Digital Time: Smartphones, Digital Calendars, and Temporal Transformation.” Paper presented at the Canadian Communication Association Annual Meeting. University of Waterloo. Waterloo, Ontario. May 26 – June 7, 2012. Ladner, S. (2012). “Changing Time: Digital calendars, smartphones and temporal transformation.” Paper presented at the Theorizing The Web Conference. University of Maryland. April 12-14. Ladner, S. (2010). “The Essence of Interaction Design: A Call for Consistency.” Interactions: An ACM Journal. March/April. Ladner, S. (2009).”Designing Better Management: A Call For Socio-Cultural Frames In Design Thinking.” Paper presented at the Design+Management Conference. Weatherhead School of Management: Cleveland. Ladner, S. (2009). “‘Agency Time’: A case study of the postindustrial timescape and its impact on the domestic sphere.” Time and Society. Vol 18. No. 2/3. Ladner, S. (2008). “Laptops in the Living Room: Mobile Technologies and the Divide Between Private time and Work Time.” Canadian Journal of Communication. Vol. 33. No. 3. October 2008. Ladner, S. (2008). “Watching the Web: An Ontological and Epistemological Critique of Web-traffic Measurement.” In Jansen, J., Spink, A. and Taksa, I. (eds.). Handbook of Log File Analysis. Idea Group: Hersey Pennsylvannia.